Our charity is one of a partnership of five formerly eight Lancashire based reuse organisations supplying good quality second hand items to people in real need through the ‘Lancashire County Council Care and Urgent Need Support Scheme’ renamed currently ‘ LCC Crisis Support ‘. It’s a cold autumn morning in Preston – but Joe, Lawrence and Martin have coffees on the go and are enjoying some banter together as they load up the van. They work for Preston charity Gift 92 and are about to deliver furniture donated by the community for local reuse. Lawrence, who drives the charity’s van, tells me the best part of his job is getting out and about. “We drive all over Preston and beyond and get to meet different people every day – they’re all having a tough time but we’re able to help them. It’s a great feeling”. Everyone who works at Gift 92 was a volunteer before becoming a paid member of staff. Lawrence continued “We were all out of work before we started volunteering here. Once you’re out of work it’s really hard to get a job and I’d just lost all my confidence. I’ve worked here for four years and being a part of this charity is fantastic – I know what we do is making a real difference to people”. Joe has worked with Gift 92 for 10 years and says the best part of his job is delivering furniture to a family with children. “I’m a father of three so it’s a great feeling to arrive at a property that’s practically empty and leave them with beds, bedding, sofas, storage and appliances – the parents are relieved and the kids are excited; it’s often a really difficult time for them and makes a big difference to have a comfortable family home”. Gift 92’s Chairman, Peter Metcalf MBE told me “We’re really proud of our team – our Warehouse Manager Janet has worked with us for 15 years and coordinates daily collections and deliveries keeping the lads very busy. They all work really hard to get the furniture in and back out to people in real need”. Gift 92 is small but mighty. Despite having a small team and limited warehouse space, they have been running for 22 years now 26 years, processing almost 500 referrals and supporting over 800 local people per year. In doing so, they prevent over 120 tonnes of reusable furniture being landfilled annually. The economic climate has meant more and more people are facing hardship, relying on charities like Gift 92 to help furnish their homes. However; these charities have been heavily impacted by funding cuts and greater competition for grant funding, meaning they are trying to do more with less. In order to survive, continue their essential services and maintain jobs; charities like Gift 92 have had to diversify – and since April last year they have been part of a ground-breaking scheme helping furnish homes for people in poverty across Lancashire. In 2013, the UK Government replaced their Hardship Loans support in favour of localised arrangements by Local Authorities. The previous scheme was a cash loan system criticised for being open to abuse. Lancashire County Council worked closely with the Lancashire Community Recycling Network to pilot a ground-breaking new service; eight local reuse organisations, including Gift 92, supplying good quality second hand goods, on a referral basis on the Authority’s behalf, to people in need. For those who have been homeless, are leaving long term residential care, individuals or families fleeing domestic abuse or those who have suffered a house fire or flood, it is difficult – or impossible – to furnish a home from scratch. CaUNSS awards are there to help people with no other means of support and facing such ‘exceptional pressure’ to help them establish a home. 90% of awards are made to an applicant with a long term health issue, a disability and/or dependent children. Like Gift 92, these organisations are rooted in communities across Lancashire, and also offer essential training and employment opportunities to the formerly homeless, long term unemployed and others ‘furthest from the labour market’, helping them gain confidence, develop employability skills and financial independence. CaUNSS has been recognised twice in 2014 at national awards events for excellence in service delivery and partnership working – a proud achievement valued by everyone involved. CaUNSS is about more than supplying furniture. Every day people throw away furniture that others need. 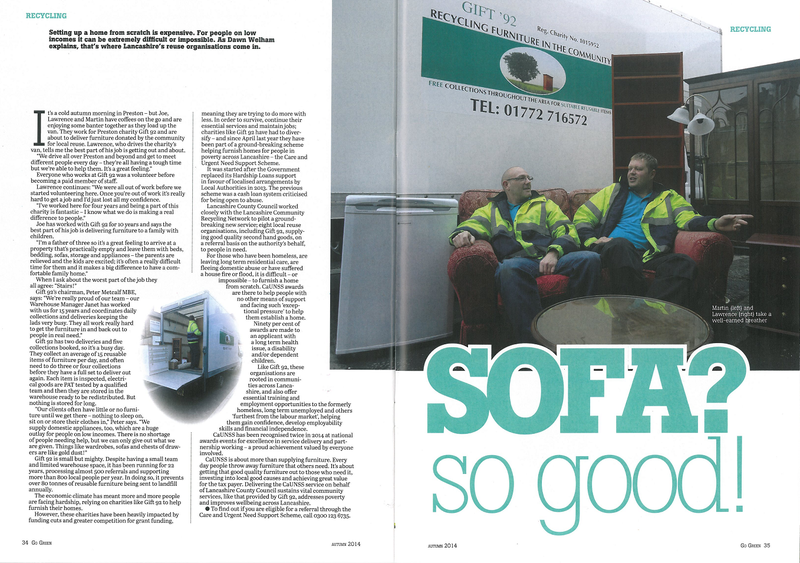 It’s about getting that good quality furniture out to those who need it, investing into local good causes and achieving great value for the tax payer. Delivering the CaUNSS service on behalf of Lancashire County Council sustains vital community services, like that provided by Gift 92, addresses poverty and improves wellbeing across Lancashire. Please note, if you live in Preston and cannot access support from CaUNSS, we may still be able to help you. Please call 01772 716572 or to donate goods for us to pass on to those in need.